By day Cherry St. Croix is the daughter of a late scientist, a madman they called him. She struggles to fit in with proper London society until she can inherit her fortune. By night Cherry does what her heart desires. She is a collector, someone hired to perform a number of tasks, though Cherry never accepts a bounty that calls for a kill. Cherry’s latest bounty sends her after a vicious ripper harvesting organs from his victims. Though an unusual task for her, Cherry accepts at the request of one of the few friends she has; a prostitute from the Midnight Menagerie who has already lost several girls to the murderer. Danger looms in Cherry’s future, both in her day and night life as she struggles to solve this mystery. I had a love/hate relationship with Tarnished. I enjoyed Cooper’s steampunk London, where years ago London was separated into two halves. The best parts of the city were literally raised above the rest to escape coal-ridden fog. The poorer folk were left to suffer below the drift. The place is even complete with airships, though sadly the ships are only mentioned in passing. I absolutely adored Cherry as a character. She was spunky and energetic. She’s a strong female lead and I can never get enough of that. She has a few interesting men in her life too, each captivating in their own way. My favorite was absolutely Micajah Hawke. He’s a perfect combination of arrogance and dark wit and I devoured every scene with him. I would definitely pick up the sequel just to read more about him. The other characters, namely Cherry’s staff, were fun as well. Most of them weren’t too deeply developed but they each had plenty of quirks to make them memorable. I felt Tarnished did take some time to get started. Maybe it was just the way it was written, but there seemed to be a lot of description in the beginning chapters. Though it was necessary for the setup of the book, it slowed the story down. What bothered me the most was just how few answers I had at the end of the novel. The mystery is great, but I’d expect a bit bigger of a reveal by the end of the book. Cooper did a great job setting up for a sequel, but I felt that nothing was resolved in this book. There was just no closure at the end of it all and even if it is the start of a series, I need at least a few answers. I’m so frustrated by it that I’m not sure I want to pick up the sequel just to be left hanging again. 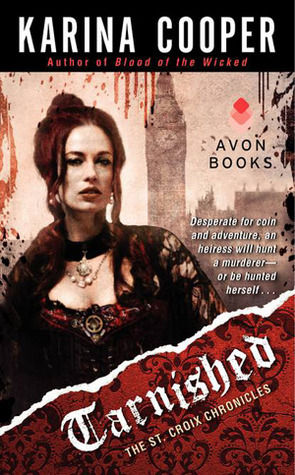 As far as steampunk goes, I enjoyed Tarnished. There were a few things that I wish could have been better, but it was still a good read.